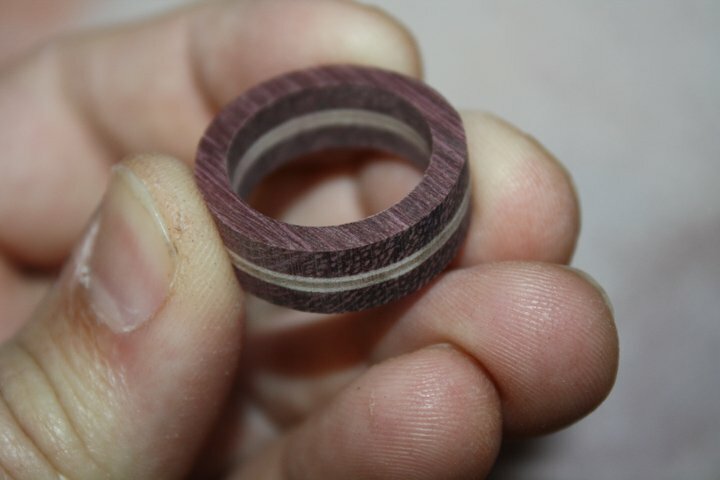 The laminated wood ring is one of the most basic in all of ring making, however it is also the most versatile. Once the blanks are made, creating a laminated wood ring is no different than making a solid wood ring. Anyone with a few tools and some patience can make a laminated wood ring. The first step in the process is to create the ring blank. This is done by gluing together several different pieces of thinly cut wood. The look and design of the ring is determined by the species and color of the wood chosen for the ring. With the amount of wood in the world, the combinations and design opportunities are endless. Finding suitable wood is as easy as going into a woodworking store and buying thin stock from their selection. Most wood stores sell thinner pieces of wood for smaller projects, many as thin as 1/8″. They also sell wood veneer, which are very thin sheets of wood that create fine colored lines in a lamination. In this case, I have a piece of East Indian Rosewood in the center, with two pieces of Birch veneer on either side. The wood on the outsides is Purple Heart. This stack will be glued together to create one solid piece of wood, which will be made into a ring. The pieces are each a couple inches by a couple inches, which will be large enough to get a couple rings from the material. The pieces you select are completely up to you. Consider the look and the design when picking out wood, and try out a few different arrangements. Once you are satisfied with the design, they are ready to be glued together. 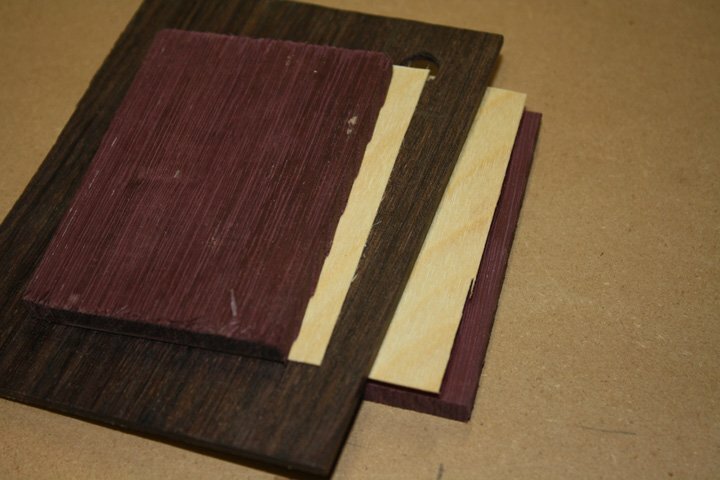 For this design, the Rosewood is going in the middle, followed by the Birch veneer. Then, the Purple Heart goes on the outsides. It really does not matter which species you choose for the laminated wood ring, but denser species tend to hold up longer than soft woods. The design also does not to be symmetrical or matching. It can literally be any combination in any number of layers that you like.
. First, arrange the pieces by color in the desired pattern, then look at the grain of each piece. For each layer, arrange them so the grain is perpendicular to the piece next to it. Wooden rings are subject to breakage with the grain, so alternating the direction of the grain in each layer helps each piece hold the next together in the weakest grain direction. This makes it far harder to break a laminated ring, because each layer is working with the next to provide strength. This is where laminated wood rings are stronger than solid wood rings. Next, apply a thin layer of glue between each mating piece of wood. Then, stack them carefully paying attention to the grain direction. This needs to be done fairly quickly, as the glue can start to set before the clamps are applied. Resist the urge to hose the pieces with glue, only a thin layer on each piece is needed. Apply clamps on the stack evenly, and apply pressure to each one gradually. 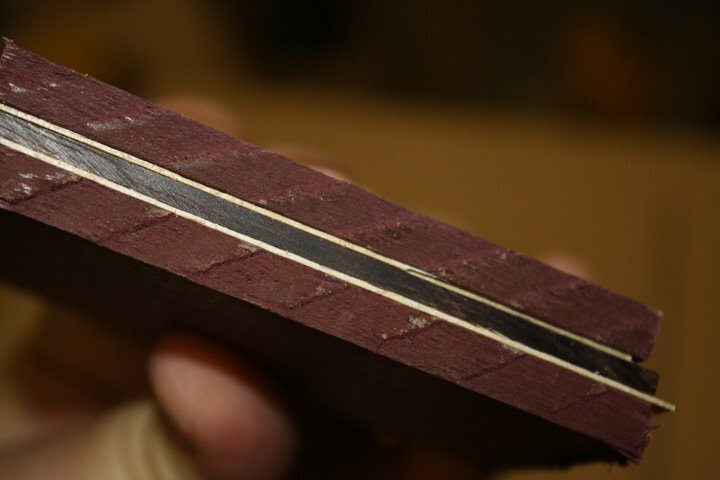 Several pieces of wood in a lamination like to slide around when clamps are applied. 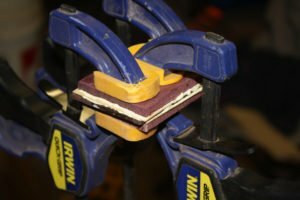 If needed, smaller clamps on the sides can be helpful in keeping the stack aligned well. Keep applying pressure evenly until the stack is pressed flat, and there is glue squeezing out from the layers. After the lamination dries, the rest of the ring making process is the same as with a solid piece of wood. Drill the center hole with a Forstner bit, then draw out the ring shape around the hole. Saw off the excess with a hand saw or band saw, then sand the ring to shape. in my shop for all my buffing needs, and it makes these rings really glow. Making a laminated wood ring is an easy process, and allows more creativity in the final look. Select the species of wood based on color and look, then arrange them in an eye catching design. These are several rings that I made a while ago while experimenting with lamination. 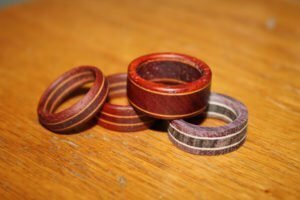 There is Padauk, Birch, Purple Heart, and Rosewood in these rings. Each one is a little different, even though they are made from only a few species of woods. This is why the laminated ring is the most versatile style. Even a few pieces of wood can be put together in different arrangements and thicknesses to create pieces that are still unique looking. The Purple Heart and Rosewood ring was not finished in this picture, but the others were coated with a few layers of Tru-Oil, (which I explain here) and then allowed to dry for a couple days before wearing. I also have details on applying Tried and True Danish Oil, which is a food safe oil finish that works well on laminated wood rings.
. I explain how to make dozens of rings in the book, all in color. 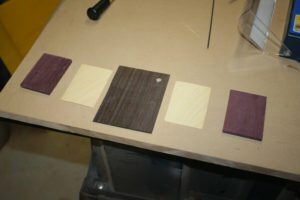 I also describe finishing, and how to choose the right drill for the finger size. 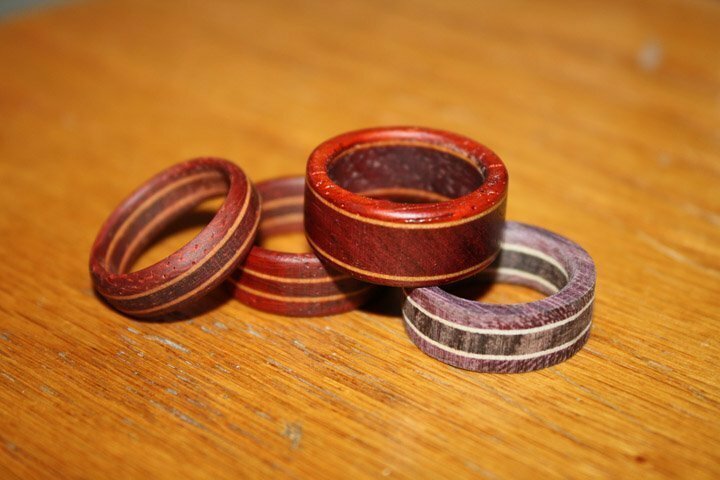 If you have any questions on Laminated Wood Ring, please leave a comment and I will be glad to answer them. Happy building.